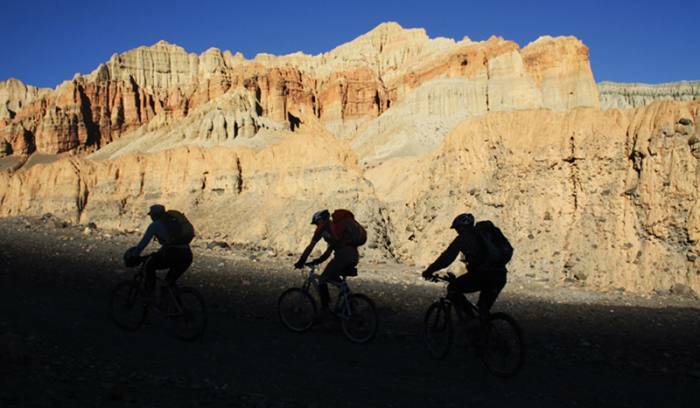 Nepal Mountain biking tour is another popular adventure holiday in different trekking trails of Nepal. Either you are professional mountain bikers or novice mountain biker, either you are planning one-day mountain biking tour or any numbers of biking tours, we have many mountain biking tours in Nepal suitable for all aged and enthusiast travelers. Mountain biking trails of Nepal are around Kathmandu valley, Pokhara valley, popular trekking trail Annapurna circuit over the throng la pass (5416m /17765 ft.) and mustang trekking trail is another most popular mountain biking tour road of Nepal. You can do one-day biking tour to 7-10 days biking tour around Kathmandu valley and minimum 1 day to a maximum of 5 days biking tour around Pokhara city is possible. Nepal trekking tourism & Adventure (NTTA) is an expert local agency for mountain biking tour in Kathmandu, Pokhara and most of the trekking trail of Nepal. We can design and organize customized mountain biking tours in Nepal as per your preference, please contact us for the trip of a lifetime!